I felt delightfully reminiscent of the '90s in my light-wash denim jacket and this cute floral dress from Chicago-based retailer AKIRA. The frock is 100% cotton, so it's super comfy and easy to wear casually. I'm also eager to glam it up for a date night with lots of jewelry and some stilettos. AKIRA would like to offer Kansas Couture readers a 15% discount. Just enter code KATY15 when you check out. 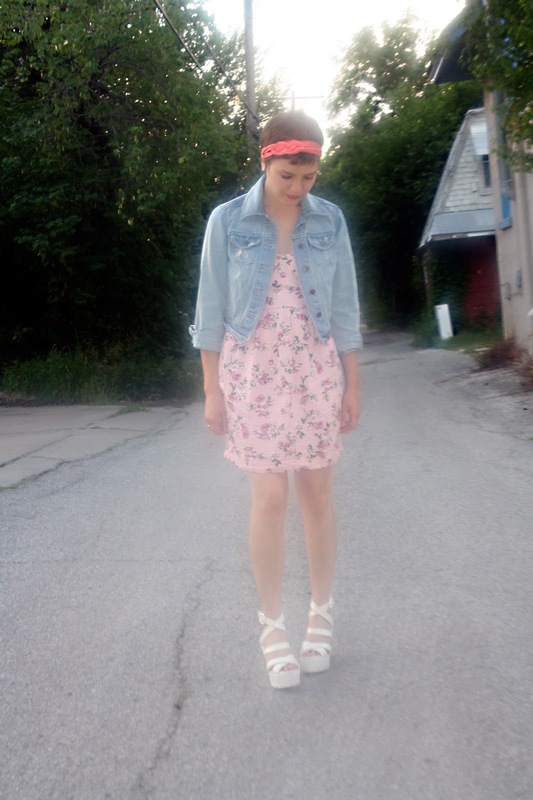 I'm not sure why some of my pictures were so washed out, but I like how it adds to the nostalgic quality of the outfit. As some of you aptly noted, I did get my hair cut recently. It is definitely the shortest I've ever had it, so I've been using pretty hair accessories to ease myself into the length (or lack thereof). Watch out for another hair update in the coming weeks! Cute outfit!! love the shoes!!! I love this effortlessly pulled together and totally adorable look! I, too, am a short haired lady and I love to play with hair accessories. Your headband looks fantastic with your hair. You mention easing into length; are you growing it out? This has been happening to a lot of my photos as well and it's because my lens has been fogging up because of the humidity, so I have to whip it down every few minutes to clear up the fog. I really like the dress. It's very pretty. cute look! love that you paired the dainty floral with the chunky white shoes. phenom! I appreciate your use of the word "frock". And I LOVE your hair so short- you look GORGEOUS! You look so pretty and your hair looks great! I love the 90's look. *Sigh* If only I had a time machine. You look so pretty! I love this outfit so much! I love your hair. I just got mine cut yesterday short. I'm short. Long hair is just not good for me. I love your 90's look! and honestly I thought you'd put that effect on your photos on purpose! Great handband. Love it with your cropped hairdo! love this look! and the short short short hair! I am really into florals right now, so I love the dress. I also love the jean jacket, and I am thinking of buying one soon, along with a leather one.